On the morning of August 8, 1886, on a walk through the Parker farm district of Wallingford, Edward Terrill and his dog uncovered what appeared to be a box of a dozen shoes that had recently fallen from a cart. The box, measuring 30 inches long and 12 inches wide, rested under a clump of low-lying bushes. Upon opening the shoe box, Terrill found the remains of a man’s body wrapped in tarred paper. The corpse was missing its arms, legs, and head. Immediately after the discovery became public, local residents began speculating about the identity of the victim and the reason for his demise. 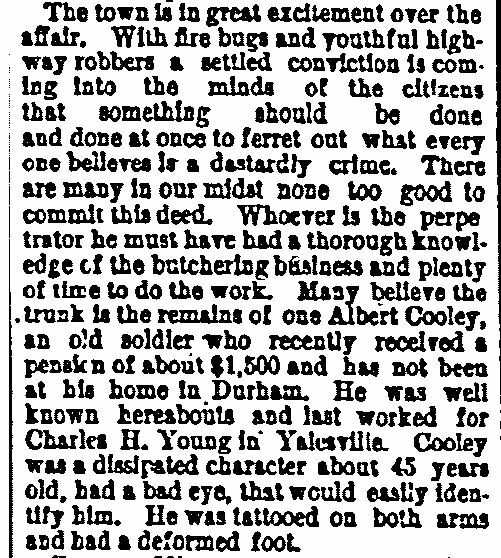 At first authorities believed the body to be that of Albert J. Cooley of Durham who went missing after supposedly taking a $1,500 pension from a local slaughterhouse, but Cooley later turned up alive. Another theory reckoned the body belonged to someone responsible for a rash of fires that plagued the town in previous weeks and that the man met his demise at the hands of his accomplices. Detail from the news article “Wallingford’s Last Mystery,”The New Haven Evening Register, August 9, 1886. A medical examination determined that the remains belonged to an unknown man of 20 to 40 years old who died 5 to 10 days prior to the discovery of his body. The New Haven medical examiner found a large quantity of arsenic in the man’s stomach and determined the cause of death to be poison. Sensational and unconfirmed stories filled local newspapers that summer and only added to the mystery surrounding the gruesome murder. One story reported local residents finding a bag in the bottom of a well near the location of the body’s discovery. Reports claim that when residents returned the next day with the tools necessary for retrieving the bag, the bag was gone, but that a piece of human scalp appeared next to the well. This led to speculation that the murderer lay in hiding near the well and, watching the remains being discovered, removed the evidence prior to the attempt to retrieve it. In September of 1886, however, police did manage to uncover two human arms and legs near the scene. The limbs appeared wrapped in tarred paper similar to that found around the torso. Police traced the manufacturing of the box to a shoe factory in Fall River, Massachusetts. There, the company filled the box with shoes and sent it to a wholesale boot and shoe dealer in Chicago who passed it along to a local retailer. The retailer emptied its contents and threw the box in the backyard of the store where it remained for several months before being sold to a man who then disappeared. This new twist fueled speculation that the remains might belong to an instigator of the recent Haymarket Square Riot in Chicago whose cohorts needed him silenced, but this lead also went cold. A local woman from the Yalesville section of Wallingford stepped forward and told police that a bearded stranger appeared at her door with a blood-stained shirt and bundle on his back and asked her for directions to a pond. The woman claimed that hours later she witnessed this same man pass back through town without the bundle and with a fresh, clean shirt, but she later recanted that story. Authorities also detained a prostitute named Mabel Preston (known by some as Mabel Gage) believing that she knew the whole story behind the murder but, when questioned, Preston professed to know nothing. Two years after the murder, Preston committed suicide. Today, the “Shoe Box Murder” remains unsolved. Both the identity of the victim and of the murderer are still a mystery. While the police continue to label it an open case, the prospect of any new information arising is too remote for the case to receive active consideration. 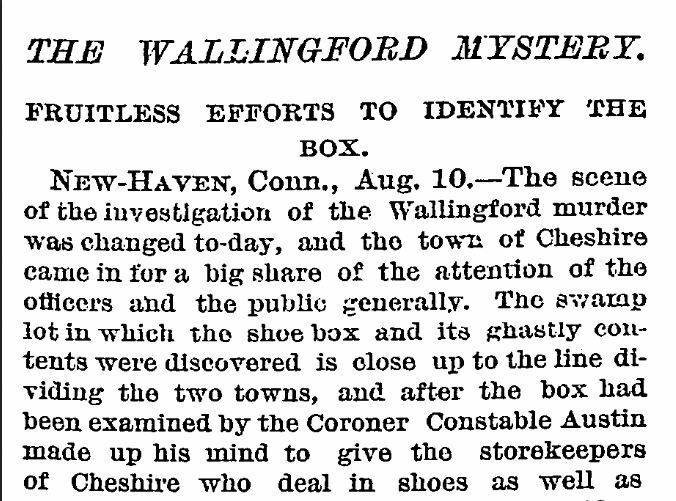 “‘A Headless Body Packed In A Box’: Victim of Unsolved 1886 Murder Discovered in Wallingford.” Hartford Courant, April 11, 2014. Link.